Sydney and Lori are back. Recently, a new behind-the-scenes photo was released for season six of Teen Wolf featuring returning cast members Claire Bryétt Andrew and Lily Bleu Andrew. The two play recurring characters Sydney and Lori on the MTV drama, which also stars Tyler Posey, Holland Roden, Arden Cho, Shelley Hennig, and Dylan Sprayberry. Behind the scenes of Teen Wolf, Season 6! The final season of Teen Wolf premieres tomorrow, November 15th, at 9 p.m. ET/PT. What do you think? Do you watch Teen Wolf? Are you excited for the final season? 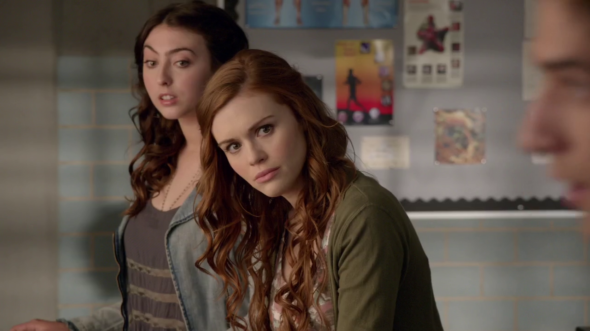 More about: Teen Wolf, Teen Wolf: canceled or renewed? Teen Wolf: How Will Stiles Be Written Out of the Final Season?